Summer is over when I say it is! Or at least when the weather starts behaving as though autumn has arrived. As long as I am picking delicious tomatoes from our garden daily, and walking outside comfortably in flip flops at 5 p.m., it is still summer in my books. No matter what people say, I am not going to yank out the perennials and I’m going to keep watering our vegetable garden until it frosts. I am not going to eat like it is October yet either. I’ve got months and months of soups and roasted vegetables ahead of me, and so for this week, while tomatoes are still bountiful, I’m going to live it up, and enjoy the last precious days of delicious tomato season. A tomato may just be the most tasty and versatile of all of the summer fruits. 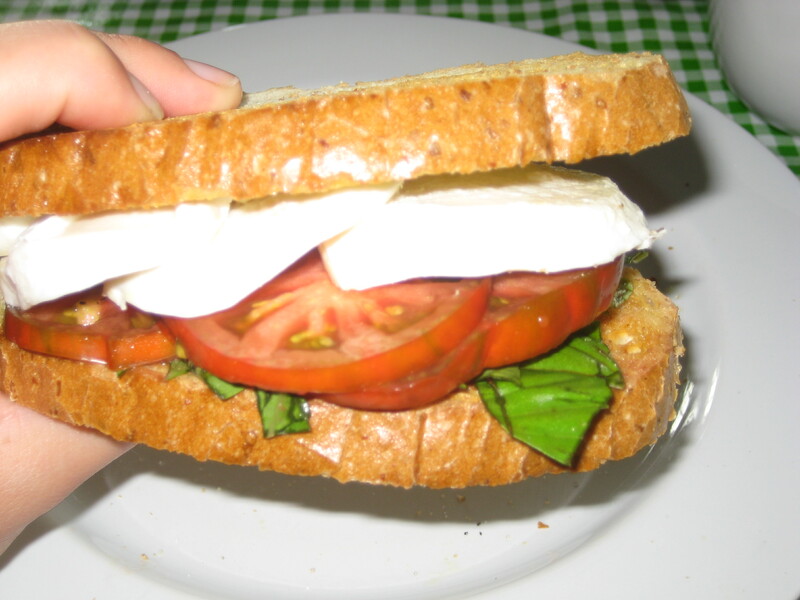 I made myself a Toasted Caprese Sandwich that I ate for lunch when I was home alone. Since I was home alone, there is no meat-eaters counterpart to the sandwich in this post. If it isn’t obvious, a meat eater would probably enjoy this sandwich just as I did, or with the addition of crispy bacon, and perhaps mayonnaise instead of basil and mozzarella if that person is a BLT purist. 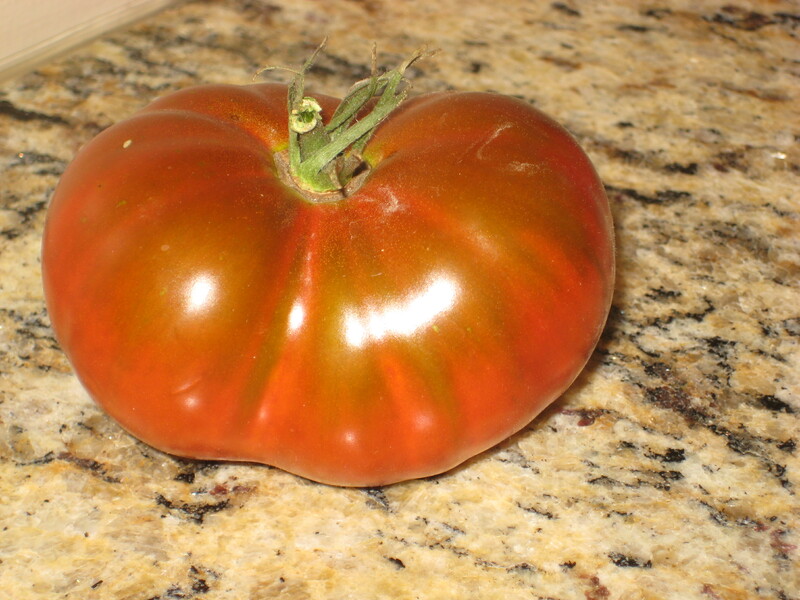 A sandwich that starts with a tomato like this is impossible to mess up. This one came from our square foot garden in the back yard. I see some amazing heirloom tomatoes at the Saint Paul Farmer’s Market, which we check out most weekends. We just walked right by them this year because we have had a regular supply of our own. To start with, I assembled all of all of the elements of a caprese. 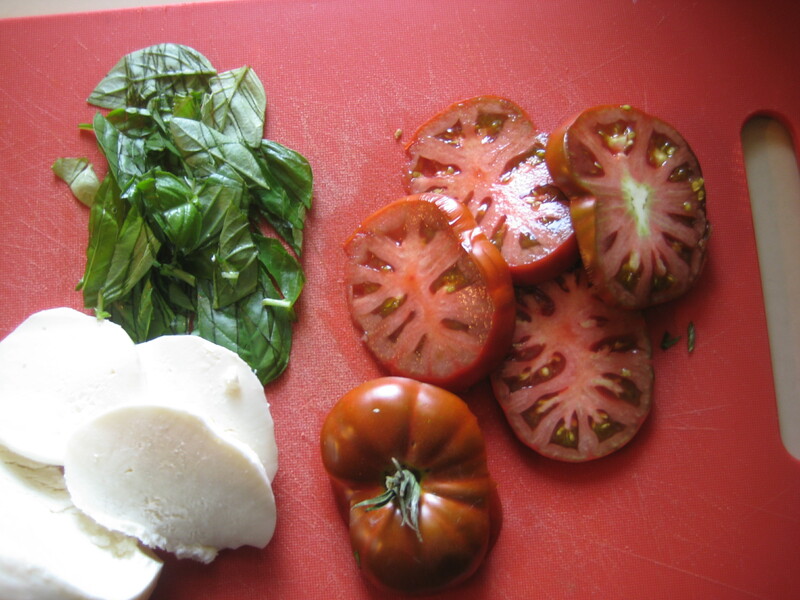 I sliced up the tomato and some fresh mozzarella and coarsely chopped some basil, also just-picked from our garden. I toasted the bread only slightly. I like to pile on the toppings, and so I needed the bread to have a little bit of give to keep it all together. 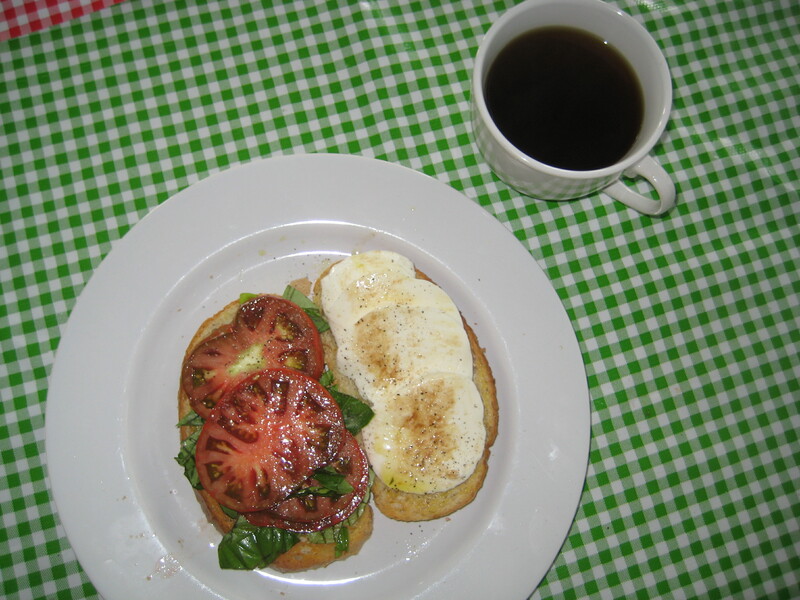 I think any version of a tomato sandwich should be eaten on either really fresh bread or toasted bread. Without bacon, all of the sandwich elements are cold, and that little bit of heat from the toasted bread lets everything get cozy and comfy and meld together rather than being one ingredient stacked on top of the next. In addition to the delicious sandwich fillings being a sure win, this sandwich was destined to succeed because it is made on City Rye. City Bread is my favorite bread in the whole world. It is made in Winnipeg, Manitoba, where I grew up. I stock up on Rye and Pumpernickel every time I am there, and when the freezer is empty of City Bread, it is time to go back, or to entice friends down to Minnesota for a visit. * I don’t think the people of Winnipeg know how lucky they are to have such a prevalence of wonderful bread available in almost all of their grocery stores. I think it has something to do with the large Ukrainian population in the city. When the Ukrainians immigrated to Winnipeg, they brought with them wonderful bread baking which is now engrained in the city’s dietary culture. I am certain that there are other great breads like this in the world, but in Winnipeg, there is no searching. City Bread is available almost everywhere. There are even a few other brands of bread that are quite good available in Winnipeg grocery stores. I grew up with City Bread, so I am partial to that particular bakery, and I accept no substitutes. I dressed the sandwich with a olive oil, balsamic vinegar, salt and pepper. 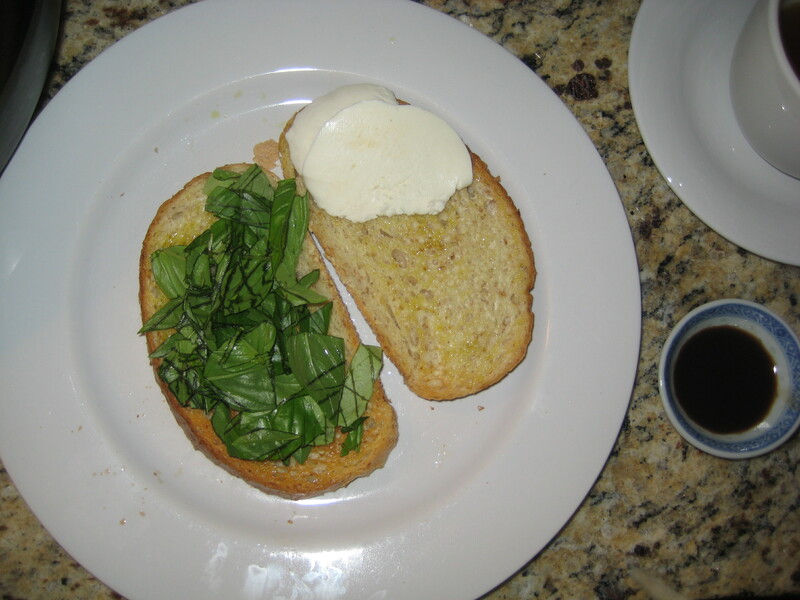 I used a silicon pastry brush to lightly brush the toasted bread and mozzarella with oil and balsamic vinegar. You only need a touch. I ate my sandwich with a cup of coffee. Kind of an odd beverage pairing, I know. The sandwich was my breakfast and my lunch. A cold Diet Coke, or a glass of milk would have been a much more appealing option. This sandwich was the summer’s best. *Please come, and kindly bring bread. 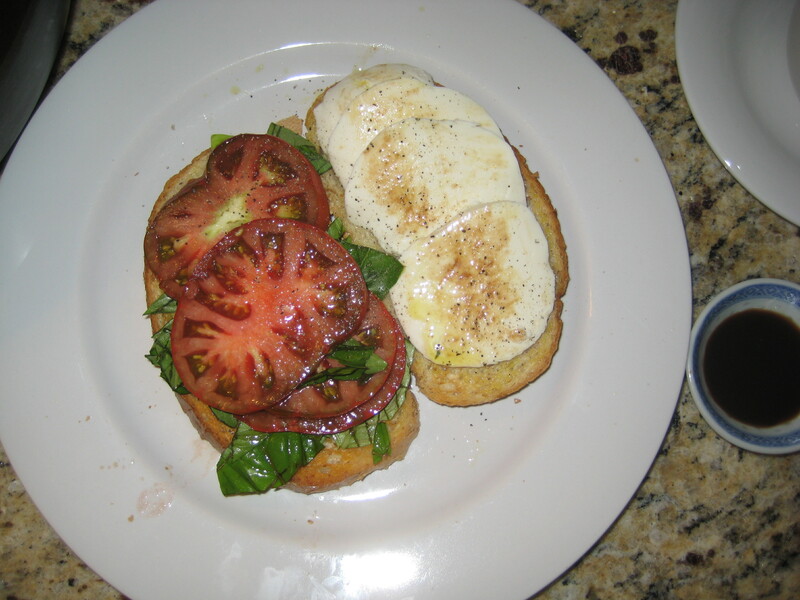 This entry was posted in Brunch, Lunch, Our Garden, Quick and tagged basil, caprese, City Bread, Fresh Mozzarella, Sandwich, Tomato by Our Way to Eat. Bookmark the permalink.